← Should I Spend Donuts on the Park Engineer? Let’s start on a positive note…shall we?? 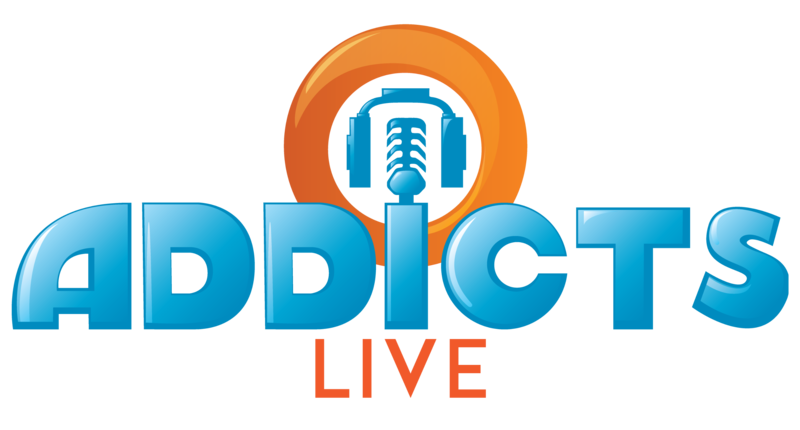 While I know that some of you are sick of hearing about Ebron’s town (mostly Ebron is sick of it) and it is rumored that there is a new drinking game that has started from my tours on TSTO Addicts LIVE, where you drink every time I say that Ebron is the “Gold Standard,” in this case...Ebron got beat out. I realize that “art is subjective,” but Holyfreakinshirt, I love SuperBeast’s ISKLand. Ebron has a monorail…but the way SuperBeast used those giant beer mugs…is SO PERFECT for the NASCAR mentality! Some of you have complained that there is no EASY way to find the fair-goers in your town. Obviously, if you have a Daily Task to find 30 of the little devils, it’s as easy as just hitting the Do It button that appears in the dialogue box for the task. But…if you don’t have a Daily Task…it is MUCH harder to find them. If you are having problems finding the Fair-goers in your town? Here is a quick video on how to find them all. NOTE: This only works if you are well below the “Next Level Number” in your crafting. If you are over…it’s going to “Level Up,” whether you want to or not….so check your numbers before trying this at home…right? If your number is BELOW the Level Up Requirement…this trick will work! For the most part…the ritual described above was working great…until I maxed out on Levels for my Crafting…and now I just don’t care. As long as I am clearing the Ride Attendants at the ItchyScratchy Gate, I am staying WAAAAAAY ahead of the calendar (like four days ahead). I will get BORT. I want Bort. It will allow me to a-bort for the rest of the event. But one annoying aspect I ran into…is that when I earned the two Parade Prizes…I found out that each one of them counts as FOUR items against my item limit. Nope. I’m not going to go off on Item Limits. EA “wins” on this one. I just don’t care anymore. I will spend my weekend…and most of next week (if not all of next week), in FULL BABY IMMERSION mode. 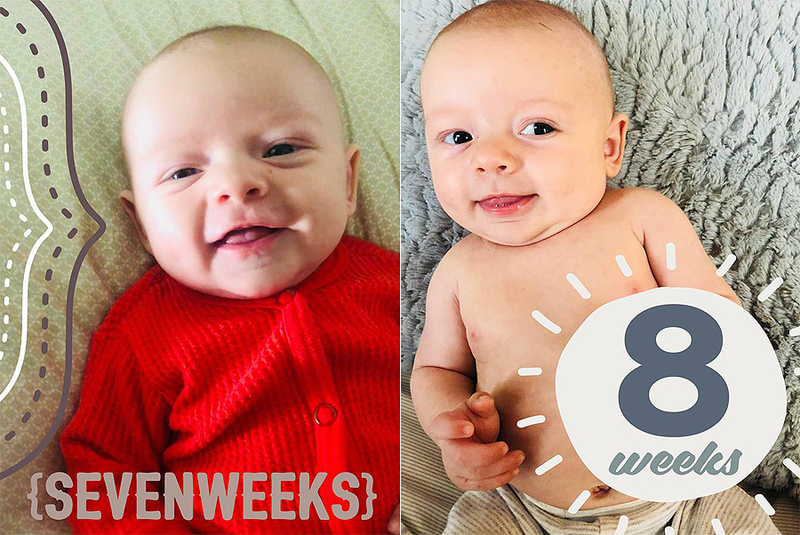 Katie and our newest Grandson, Jake, are flying out to spend a week with us, and showing off the baby to all of the family…including Great Grand Parents. He is getting big…fast! And smiling…and laughing…and I. Can’t Wait. So go ahead, EA. 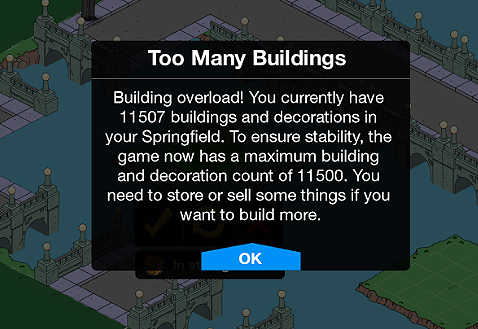 Keep blocking me out of enjoying about the only thing I still love about TSTO (designing with loads of details). I am fine to take this “forced suspension” until you get your collective programming heads out of your collective programming posteriors…and do something about the item limits. I’m cool. I have a life. And in the meantime…I’ll just laugh at J. Edgar in his little pink dress. 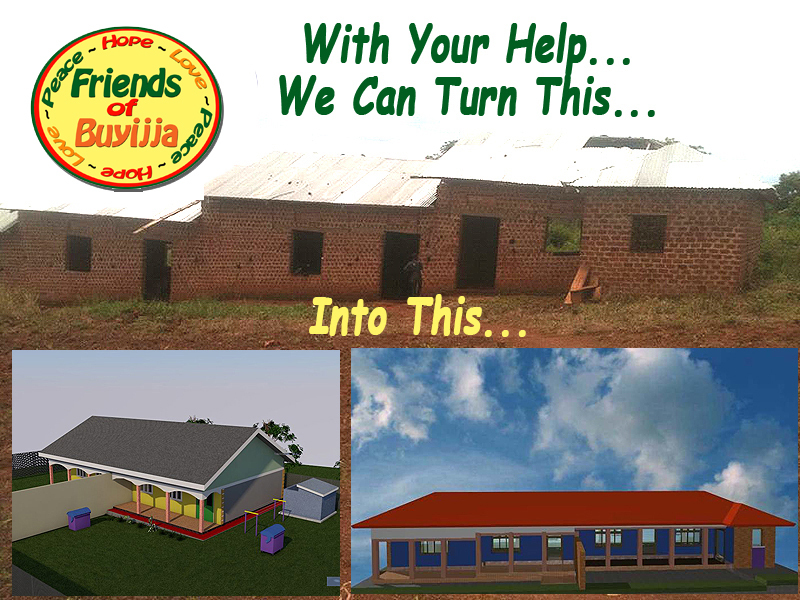 OH>>>>>>>>>> and another reminder to Donate If You Can to our Biggest Project Yet! We’re getting there… we still have a long way to go! 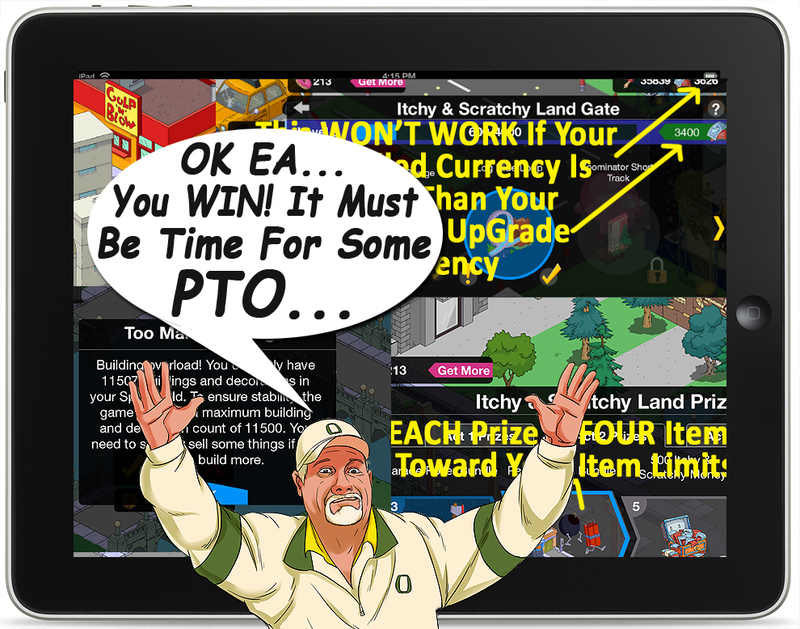 This entry was posted in Friday Filler, Tapped Out and tagged Design Guides, Faster ways to tap, Itchy and Scratchy Land, Itchy and Scratchy Land Tours, Tapped Out Tips and Tricks, The Simpsons Tapped Out, Time Management TSTO, TSTO Addicts, TSTO Cranky Old Guy, TSTO Tips and Tricks. Bookmark the permalink. Grr, after missing out on Diane in Act 1 (would have cost me 75 donuts), I thought I’d been pretty consistent in Act 2 tapping in around three times a day and would be in good shape. 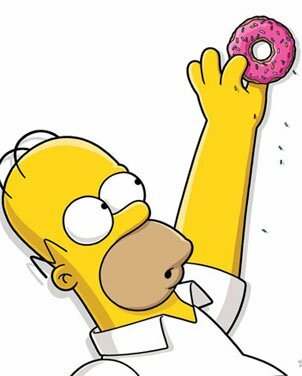 But I’m still 4,000 shy of 500 I&S Money, so I may not even get to Bort in time without having to spend donuts (and no shot at bonuts). Kind of frustrating. What’s your amusement bonus? How often are you sending characters/ how many times a day? How many characters are you sending? 1. Max out you amusement bonus (35%) so you can get the maximum amount of prize currency from each character. 2. 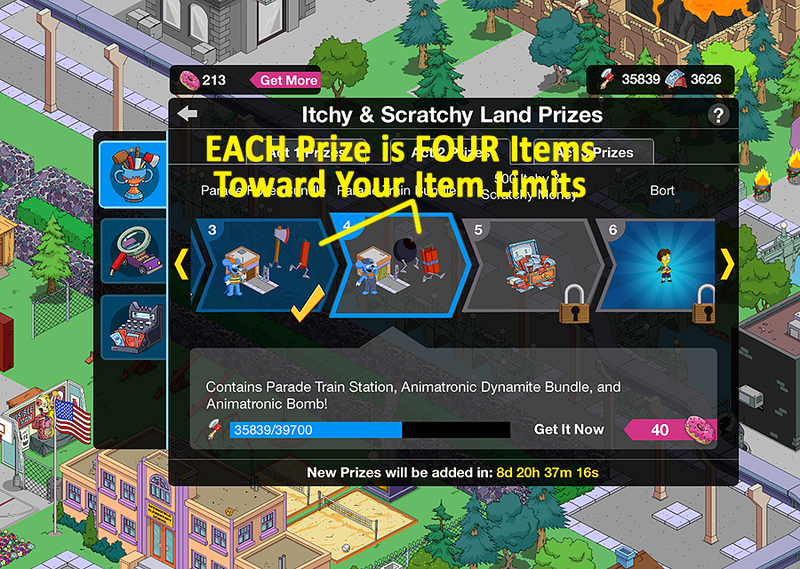 If you can’t get into the game for 8 hours or longer (work, sleeping etc) send Itchy and if you have event premium characters (Jeremy, Scratchy, Ms. Mouse, Squeaky Voice Attendant, June Bellamy, Park Engineer) on their 8 hour tasks which earns double the Axes and I&S Money (120 Axes + 50 I&S Money per character) than the 4 hour tasks at the gate. 3. If you don’t already, try logging in 4-5 times a day to ensure you get more currency at the end of the day. 4. Visit at least 10 neighbours a day so you can get an extra 150 Axes. 5. Keep tapping the park visitors in your town every 4 hours until you get the message stating there are no more park visitors available so you can get 300 Axes every 4 hours (1200-1500 each day). 6. Daily challenges give out 1500 Axes each day so be sure to collect and complete them if you haven’t been already. There’s no excitement to get the prizes crafting and prize track they stink.. especially the crafting. Not my favorite event by far. And again sooo much potential I mean seriously a theme park event. But again lacking creativity just so maginnis. Another trick to find the fair-goers is when you have Bort unlocked (and placed) and are working on bonuts, you tap the axe icon in the task book then tap the “do it” button which then takes you to a fair-goer and you keep doing this until you run out of the fair-goers in your town. As someone who was affected by the lagging I am so far behind it feels. Everyone is getting the last prize and I’m just now getting the 4th prize. I’m hoping I can still get the prizes and catch up. Was anyone else affected by the lagging that they too are behind? The only real option, as I said isn’t he article, is to ONLY cycle your ride workers every 4 hours…and do the daily challenge. The lag doesn’t come into play there. I got Bort yesterday (Friday) which will allow me a slow tapping weekend. Maybe i visit my town a couple of times, but not 4 times a day. Besides, it’ s wc soccer and we have an important game at 2 pm. I accidently wasted crafting currency on levelling up, but what the heck, i will have enough to get a jump start for act 3. It’s true, for old time players these acts are easy (usually) even without rushing, but i can understand for newer players it’s still difficult. After obtaining Bort yesterday? I can honestly say don’t waste your time trying to get this worthless Character – go spend the Sprinkles on the Park Engineer! Why? Because that is the type of Character we should have as an Event Prize! Busy collecting foam axes for Bonuts? Don’t bother logging in 4 to 5 times a day (take a break from this grind, take a day off and enjoy time away from the game, 2-3 times daily is enough to get those Bonuts), unless you are Kem Farming. Just put those other Characters on 24 hour Tasks (you won’t need them). Do not feel guilty having to plop Krustyland Buildings, then go back later to decorate. Until one finds a way to eliminate the lag / freeze ups? Tappers are going to have to figure out what animations (via a Building – or Decoration) has to be stored and/or turned off. And this stinks, because part of the fun of this game has been the animations actively taking place. I truly hope EA is listening to the complaints, as well as actively finding ways to solve them, because I can see more Tappers leaving this Game App if things don’t improve. I have personally gotten over the fact that Event Prizes are not going to be Premiums. Therefore one has to decide if completing an Event is worthwhile, or if it’s more rewarding to Kem Farm and get those new Premiums from the Store. Has there been any discussion on farming gift shops or Krustlyland burger? Many events ago, I noticed a trick for finding wandering park guests (and their equivalent in other events). 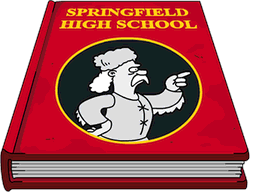 While they can generate anywhere in Springfield, they all walk slowly toward the same place… the bonus area. All you have to do is go there, and put your device down for a few minutes. When you come back, you’ll find lots of tappable park guests (or their equivalent, in other events) gathered together for quick and easy tapping. Yup. Walk away for a few minutes. It really is that easy. Ebron and superbeast have such great design talents and I think both have done a great job on their new ISKLand areas. Through watching your town tours I have been inspired to try and improve my own designs and think I’ve done a pretty good job even though it’s not anywhere near as good as the two in your video. At the end of the day its real life that really matters and not item limits. Item limits can increase, but real life does not so we should all make the most of it while we can. Does it really matter if we have to store a few flowers in a game? I know it’s frustrating, but we can still enjoy the game by adapting our designs as Ebron does. I hope you have a wonderful week with your geourgeous grandson and family. the choice to destroy a design, so I can place stuff I am forced to take in an update/event. There is no logical reason for the limits… so, it will continue to be an annoyance. Lazy programming. Plain and simple. But, as implied by the rest of the article…I’m fine with walking away from the game for a few days while real life takes over! You should not have to destroy that which you have taken time to design. I have not quite reached the item limit so I have not had to make decisions about what to keep and what to destroy or store and do not know what it feels like for players like you at the limit. I suppose i will find out how frustrating it is soon, but in the meanwhile I have the luxury of being able to design as I want for a short while. Enjoy your week of letting real life take over with your very cute grandson! 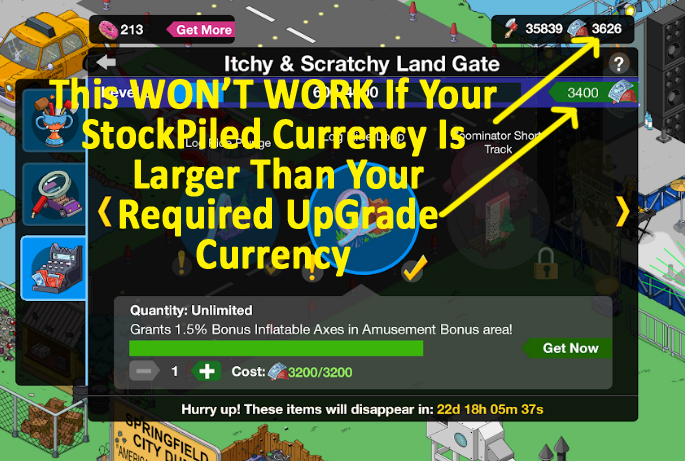 I think that if they have this item limit, they should offer alternatives to the tiny items, someone here (somewhere) mentioned longer pieces of fences in addition to the tiny ones, so we could place one item instead of for example 10 tiny ones, theres no reason not to have them offered in the store. There could also be longer monorail pieces, because we dont make turn or S bend all the time, there are straight section that could be just one longer piece, not bazilion small ones. I would also like some forest sections, like the dead groves from halloween some time ago, so I could replace my forest area (that consists of a lot of single trees now) with fewer items, but have sort of the same effect. That makes sense! Clusters of fence…flowers…trees etc. make way more sense, at least as an option. More of grouped items, can be locked together as one item, but also you can unground/unlock them to single pieces. I totally agree…the new “tall shrubs” are a perfect example. Why not have a hedge row of 5 bushes (or more) instead of one-square pieces. I would love to add more of them, but don’t want to use up 30 or more pieces on a small bit of decoration. Also, many of the properties that used to be offered were already landscaped …compare the halloween hill house or the marsh scene with some of the super plain buildings (scotland yard, the palace, or the tower) we’re getting now. They had a large footprint, but you didn’t have to add a thing to place them and enjoy them, which meant you were placing one item instead of 20 or more. Let the artists add a few more embellishments or complete a property, and I think the piece count limits wouldn’t be such an issue. People who have been playing a long time will have hundreds of the same thing e.g. hedges. It would be good if you could group store several together and have the option to replace them as one long line counting as one item. It could even go further and give a blank plots on which you could place different items: tree, flower, shrub etc and when you place it that would also only count as one item. Obviously the different items could not be moved individually in your town but you could have the option of storing and separating them for individual placement.